Often I hear people say they could never Homeschool their kids. The reasons why vary, everything from not having enough patience, to feeling unqualified, to not wanting to be around their kids all day. To a first time homeschool Mom the comments may cause doubt in your own mind whether you have enough patience, qualification or desire to be with your kids every single day. We all have insecurities, am I right? In Motherhood I have plenty of doubts but instead of backing down and letting them win, I fight back. I show up. Make a mental list of my doubts then push back with everything I’ve got to prove myself wrong. What matters isn’t that you are perfect but whether or not you’re going to be fearless in the face of your own doubts. To be fearless doesn’t mean you are without fear, but that you are audacious in the face of fear. Fighting the insecurity battle is no different in Homeschooling than it is in Motherhood. What matters is that your called. If you are called to it, God will equip you for it and work through you despite your own inadequacies. Grace will fill in the cracks. And I’ll tell you a secret, not only will you disappoint your kids but they will also disappoint you. And you will also fumble as you pass the grace back and forth, parent to child and over time God will redeem the broken parts. So all that said, why do I Homeschool? Our Newborn years were brutal. An abundance of sleepless nights, colic, food allergies and isolation. By the time they were able to have a conversation with me and keep me company during the day the last thing I wanted to do was put them on the school bus leaving me behind with all the not yet speaking littles! No fair! As hard as it can be to be around my kids all day, honestly it is difficult, I wouldn’t trade the time I am sharing with them. Each and every day I get to observe as they morph from 3 year olds, to preschoolers to elementary sized littles. These changes occur as quickly as my eyes blink a few times. It’s the best and I want them all to myself! My husband and I were both homeschooled our entire lives. It IS our normal. Sending them to school would be strange for us. Second generation homeschool problems I guess. True story. We don’t have to wake up and meet a school bus at the crack of dawn. Our schooling can be done in a few hours a day and we are in no rush to get up in the morning. We can take our time while we wake up, get ready, eat breakfast and go about our day. Everyone is well rested and ready, including me. All of the homework is completed when daddy gets home. Then we get the rest of the night to spend playing outside, having dance parties or enjoying some good books together. I believe play is one of the best ways kids learn. This lifestyle has not only added family time at night but many unrushed hours of Legos, Playmobil, dress up, art and outside playtime in the afternoon. My kids love Jesus and so do I! We start every morning learning more about Jesus, laying a spiritual foundation, memorizing scripture and learning how we build our character. The greatest success of my life would be having my kids grow old loving Jesus. I don’t believe that school is the most important place to be the light of Jesus, it happens everywhere we go! And despite homeschool stereotypes we do actually go places, it’s a big world out there. We only have so many years to invest the faith in our young ones before they are on their own, I don’t want the fire doused before they even graduate from high school. I want my kids to make connections between everything the learn! When they experience organic education it’s hard to imagine learning any other way! When Dreaming Daughter took a long time to understand how to read, no big deal! Bored with math due to “getting it”, let’s go as fast as you desire! When Tenderhearted Guy was extremely interested in freaky looking deep sea animals, well we just went with it! Wild Little Girl loves workbooks, we just go with the flow! A child feeling unloved, we smother them with love. Another dealing with laziness, we deal with the laziness. Mom dealing with anger, Mom better work on being more patient. Siblings constantly bickering? We solve that problem ASAP. Especially that one! We don’t get the option of passing the responsibility of raising these young ones to anyone else so we MUST deal with our issues. No homeschool Mama can handle a house full of kids who are running around with no discipline all day and therefore you get the issues under control, well as much as you can anyway! Homeschooling isn’t for everyone and I mean that sincerely. It is hard work for those who are willing to persevere, pray and depend on God to fill in when we cannot be everything for our kids. Because the fact is we won’t always be there for them however we can keep pointing them to the One who will. Someday I hope my kids look back and remember their Mama was brave enough to do the hard thing as long as it was the right thing. 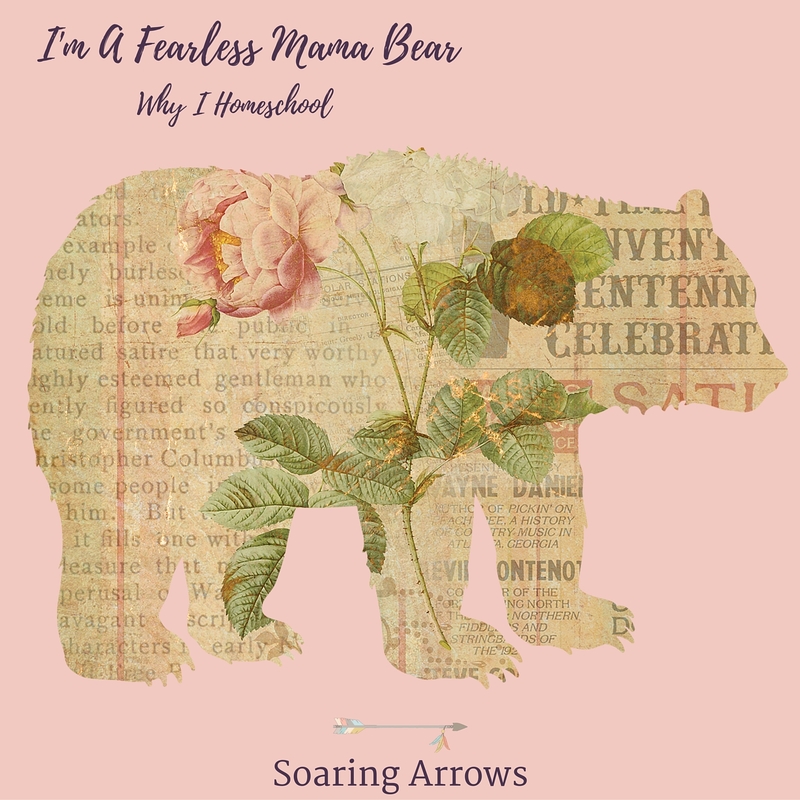 I’m a Fearless Mama Bear. Melissa, this is really, really wonderful! #3 – girl, ME TOO! Whenever people say “I don’t know how you keep track of it all” I always say “I don’t know how you have everybody up, dressed, fed, packed and out to the bus by 7am!” 😉 I also LOVE #9. Stuff happens. But in homeschooling, there is no rug to sweep it under! Good, good stuff, girl! Keep it up!! Oh girl.. the number of times I’ve said “I only homeschool because I’d never get my kids to school in time”… hahaha! I’m kidding of course, but only partially. 😉 I agree with everything in this post. Perfectly said! Lol I wasn’t kidding! With 4 kids it’s hard for me to be anywhere on time! Thank you for this! One time in the eye doctor’s office I was asked why I home schooled my kids. My reply was that I had my kids because I wanted them, so why would I send them away for 8 hours everyday for someone else to enjoy. Second of all I agree with you about teaching them to love Jesus and learning to have a relationship with Him. My motto has always been: “Do my best and pray that God will fill in the gaps.” I now have three adult children out on their own and God has done exactly that…filled in the gaps where I had not been enough. No it has not been easy. But it pays off in the end.